Paul Pierce, The Truth, knocked down an improbable three fading out of bounds as time expired to send the game to overtime and keep the Wizards’ season alive. Not so fast. The ball was still in his hands as time expired and that’s how the Wizards season would end as the basket was disallowed and the Hawks win the game 94-91 to close out the series. DeMarre Carroll was a nightmare matchup for Paul Pierce tonight as he scored 25 points on 9-14 shooting. Jeff Teague also had a great game for the Hawks with 20 points and seven assists; many of his assists coming at key times late in the game. Paul Milsap chipped in with 20 points and 13 rebounds as he was also too much to handle for The Truth when the Wizards played small ball. For the first three quarters of the game, it looked like the Wizards regular season squad from January-March. Forcing the issue, turnovers, bad shots; things didn’t start off well. Nene was out of control to start this game. Missed layups, missed shots, and a double foul early with Paul Milsap; you could tell the big man was frustrated and forcing the issue. The Wizards endured a 4:15 scoring drought during the first quarter but didn’t fall into too deep of a deficit. Kevin Seraphin was inserted for just the third time this series and provided a much-needed spark off the bench. Seraphin was very active on the glass and helped spark a 14-3 run for the Wizards as they would regain the lead 20-19 after one quarter. The Hawks killed the Wizards on the glass in the first quarter, it was the opposite in the second. Early in the quarter there was a possession where Otto Porter ripped down three offensive rebounds. Unfortunately, the Wizards were unable to convert on these second chance opportunities. The teams would trade buckets for most of the second until Paul Milsap hit a floater as time expired as the Hawks closed the quarter on a 6-0 run to lead 45-39 at halftime. The Hawks pushed the lead out to 10 early to start the third. Paul Pierce didn’t score his first bucket of the game until the 8:30 mark on a layup and fans hoped that would get him going. Unfortunately it did not; and the Hawks always had a counter when the Wizards made a push and the lead ballooned out to 15. 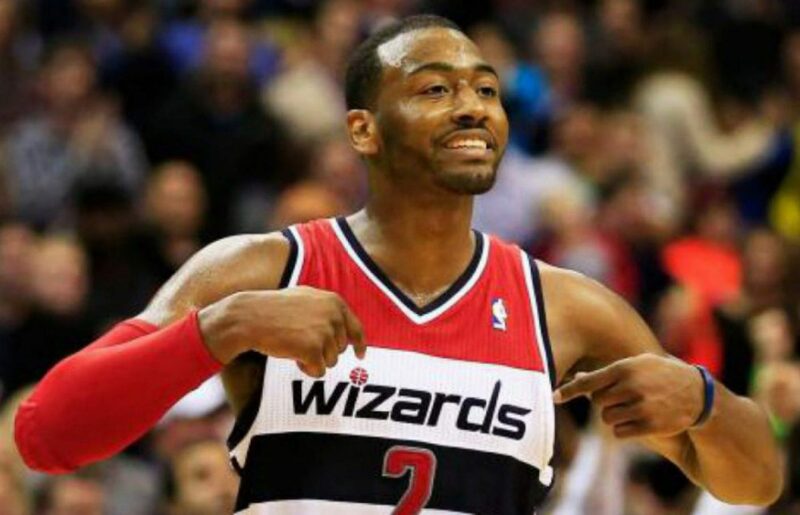 The Wizards utilized a 7-0 lead to get within striking distance but were down, 72-64 going into the fourth quarter. Bradley Beal knocked down a huge three pointer to start the fourth quarter and the Wizards found themselves just down six points. The Wizards defense fell asleep and allowed an easy transition dunk for the Hawks on the other end. Jeff Teague and Dennis Schroder were tough match ups as they continued to slice their way to the hole using pick-and-rolls at the top of the key. Bradley Beal continued his impressive playoff run as he hit a jumper on the baseline for his 20th point. Beal has scored 20+ points now in 11 of his 21 playoff game appearances. Pretty remarkable for a 21 year old. The Wizards continued chipping away at the lead mainly on hustle plays and transition baskets from the House of Guards. John Wall found Bradley Beal in the open court who dunked it down and the Wizards were down just 1, 87-86 with 4:23 to play. Beal backed that up on an isolation move to get open for a baseline jumper and the Wizards regained the lead 88-87 for the first time since the second quarter. The Wizards faltered down the stretch missing 3-4 free throws and committed a couple of turnovers. Even so, with six seconds left, the Wizards found themselves down just three with the ball. The ball found it’s way to The Truth. He didn’t get a clean look but dribbled away from DeMarre Carroll and threw up a contested three while fading out of bounds; it went in! The refs reviewed the play and determined that the ball was in his hands as time expired. Game, series, season. Hawks win 94-91 and advance to the Eastern Conference Finals. Wizards are going home.